The neem is a very effective tree that is used in the Ayurvedic treatments. All the parts of the Neem tree are helpful in treating the various diseases. The barks of the Neem tree can be used as a brush to brush the teeth. Its leaves are the most used parts. They are used to treat the various kinds of diseases due to the various properties in them. They have the properties like astringent properties, antibacterial properties, aesthetic properties, Antifungal and antiviral properties. These properties are so concentrated that the Neem leaves are used to treat in almost every diseases and the skin infections, skin rashes, acne, allergies, pimples, itch, scars and inflammations. In the beauty industry it has been used to enhance the appearance of the person. It benefits the oily skin by absorbing the excess oils. It makes the skin impeccably clear and perfect. Now-a-days the leaves of the Neem are used in the manufacturing of the skin creams, lotions and pastes that can be used on the people who crave to be relieved from the common skin problems. They are also used in the Ayurvedic and the herbal products. The Neem leaves have made their way into the preparation of the soaps and shampoos. The use of the Neem leaves in the treatment of the pimples and acne traces its origin to the antiquity. They are capable of relieving the skin from all kinds of infections. Hence more and more people have started using the neem leaves in the treatment of the pimples and scars. This needs no proof as the results themselves are very evident. So this beauty article is all about how to cure pimples & scars naturally with the use of NEEM. Lets see how it is working effectively. The neem leaves can be made into a paste and applied on the skin and they can also be used in the combination of one or more herbs. These help to attain the purpose with no possible traces of side effects. Any kind of skin problems can be treated with the neem leaves and they only benefit the skin. The neem packs are vital and they also can be used in a daily basis or once in a week. 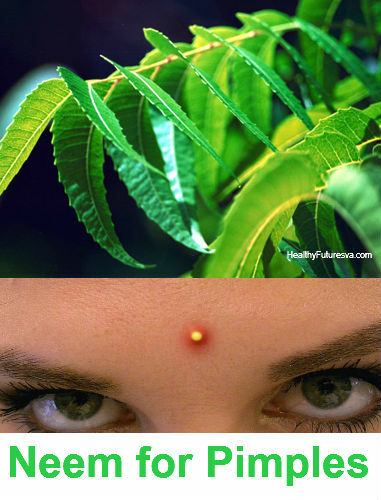 The neem leaves are used to treatment the pimples and scars. The Natural neem leaves are taken fresh from the trees and are crushed. The small amount of the water is made into a paste and about two or three pinches of the turmeric is added to the neem paste. They have to be mixed well. The face is washed before applying the neem paste on them. Then the mixed paste is applied on the face before it gets dry. The person has to wait for about half an hour before washing the face. The face must be washed with the cold water. It helps to treat the problems of the pimples and acne. This must be followed for a week, within which the person will be able to see for themselves the results. The neem powder can be used instead of the neem paste. It can be prepared by drying the neem leaves in the sun for about few days. Then the neem leaves are blended to make them into the form of the powder. The neem leaves are grinded and made into a paste. They are then mixed with the three spoons of the lemon juice. It is blended nicely and made into a paste. The face is made wet and the paste is then applied on the face. It is allowed to remain for about half an hour and the face is then washed with cold water. Instead of neem paste, the neem powder can also be used. The neem paste is made and the face is washed to be ready for the application of the neem paste on the face. The curd is taken in a bowl and mixed with the gram flour. The contents are stirred and then mixed together to form a perfect blend. They are also applied on the face. After an hour, they are washed with lukewarm water. The problems like scars, pimples and the yeast infections will be relieved from the skin of the person due to its astringent properties. The neem paste must be mixed with the basil leaves and must be made into a finer paste. Then few drops of honey must be added to it. A handful of the multani mitti must be dropped into it. If the paste is still smooth, then a few handful of the multani mitti is added again. After the paste is then rubbed on the face and the face must be scrubbed. The face must be washed after half an hour with cold water. The dead cells are removed from the skin and the face starts glowing automatically. The neem paste is then mixed with the sandalwood oil and rose water. It is applied on the wet face of a person. The face must be washed after some fifteen minutes. This helps to treat the problems of acne and pimples. Sometimes the pimples and the acne occur as a result of the oily faces. As a result they must be treated also. The neem face packs that treat the oil skin condition and the pimples and acne are as follows. This is prepared by mixing the sandalwood oil with the neem paste. It helps to to clear the skin by removing the excess oil. The face must be washed after fifteen minutes and it must be done thrice in a week. The neem paste must be mixed with the gram flour and the milk. It must be blend in the perfect combination. It must be applied on the face and it must be washed with cold water after fifteen minutes. This helps to remove the dead cells from the face. This also treats the oily faces. The neem paste must be mixed with the coconut water and fuller’s earth must be added to it. The face must be applied with the fuller’s earth and then washed after fifteen minutes. This helps to clear the skin of the excess oil. The acne and the other skin infections are also treated step by step. The neem paste must be mixed with the honey and rubbed on the faces. The honey moisturizes the skin and helps to eradicate the skin problems and also curbs the oil in the skin. This acts as the best exfoliating agent and imparts a fair glow to the face. A pulp of the papaya fruit is needed for this. The neem paste is mixed with the tomato juice and then applied on the face. This keeps the face hydrated and also imparts a glow to the skin. The neem leaves paste for the glowing types of the faces have to be mixed with the tulsa leaves and the honey. They have to be mixed well and applied on the face. This helps to remove the dark circles. Neem leaves can be used alone for the treatment of the glowing skin. The neem paste is mixed with the milk, gram flour and yoghurt. They are applied on the face and washed after fifteen minutes. The neem paste has to be mixed with the turmeric powder and cream. They must be washed after fifteen minutes with cold water. The Neem leaves can be used in combination with any of the natural ingredients. They help to tone the skin and also help to relieve the skin of the blemishes, scars, pimples, acne and also other infections. They are suited for all types of the skin. They have a soothing sensation on the skin. They must be used regularly for the effective results.